Did you secure supplies yet to make your soy milk Halloween costume? Or are you planning on recreating Justin Timberlake’s “Veganville” costume, and going as tofu? Or maybe you’re planning on dressing like your favorite vegan cheese, like Jessica Mahady did when she created a costume based on Daiya Cheese? Whatever your costume plans are for this year, I have little doubt that if you’re reading this, it’s important to you to use October 31 to combine the fun of Halloween with the cause that drives you (as it does me). Let me bring your attention to Humane Halloween, a new project by activist and writer Marla Rose. 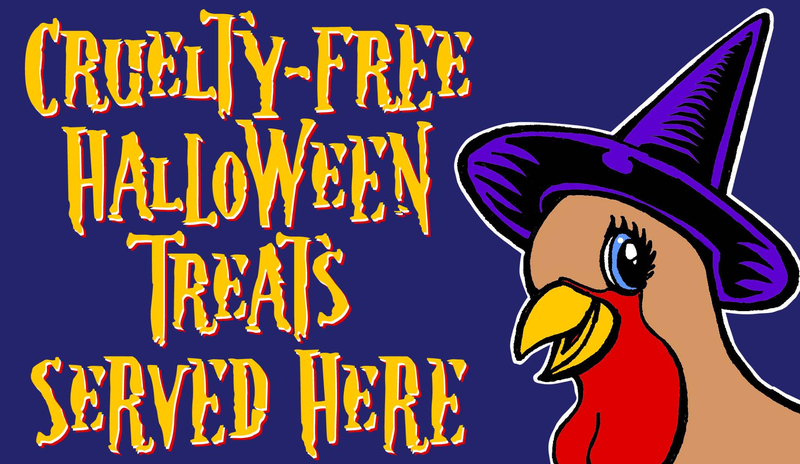 In addition to providing downloadable cards and signs (saying things such as, “This candy was made without hurting animals, so it won’t scare anyone”), the website also includes a handy list of slavery-free, fair-trade vegan chocolates (as touted by the Food Empowerment Project), as well as suggestions for what treats to give out that aren’t chocolate (though, honestly, a Halloween without chocolate is like a beach without water — what’s the point?). Well, as a non-mom, but nonetheless someone who cares deeply about both animals and children (shocking, I know! ), I truly couldn’t be more elated about Humane Halloween, and I’ve got to hand it to Marla for organizing this event — which she has plans to expand in the future. I love how all-encompassing she makes this, providing us with all the tools we need. Definitely, absolutely, without question join the Facebook page for Humane Halloween, as it is updated frequently with recipes, ideas, and news. 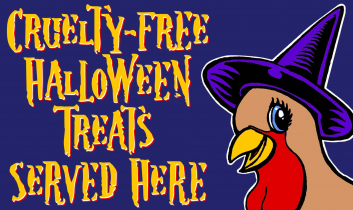 Last year around this time, we talked about Reverse Trick-Or-Treating, which — similarly to Humane Halloween — encouraged folks to hand out some kid-friendly, vegan-themed leaflets with the candy. We also included other suggestions for using Halloween to speak up for animals, such as hosting a vegan-themed costume party; reaching out to the media (latch on to Halloween stories with letters to the editor discussing veganism and animal issues); and organizing a theatrical Halloween installation. The point is, when you squint your eyes a little, you’ll see that there is literally always a way in for discussing veganism and animal rights — we just have to get a little creative. Finally, while we’re on the subject of late October, I will take this opportunity to shamelessly plug my birthday, which is on Mischief Night — October 30. The reason I’m bringing this up is not (just) because my birthday is the official start of the holiday season, but because I am hoping to raise much-needed funds for Our Hen House’s efforts to change the world for animals — that is my birthday wish, and that is my birthday campaign. Because I am turning 34, I hope that you will donate $34, $134, or whatever you can afford (it’s all tax-deductible) — with the goal of raising $3,400 by October 30. And just to remind you, this year is extra special because, thanks to our Barnyard Benefactors, all donations made between now and the end of the year are being matched! This includes your birthday donations! So thank you, in advance, for making my birthday extra special.